Wide variety of activities to choose from. Cliff diving of course and we also got to do snorkeling and kayaking. unfortunately even though stand up paddling is available, there are only two boats and we didnt get the chance to use it. food selections are also varied and delicious. the unlimited drinks is a great add on. the place is beautiful and clean. staffs as courteous and friendly. i wish that the time of the tour can be extended even for just an hour because the place was quite far and maybe almost an hour is spent on just the travel to and from the island leaving us only 3-4 hours of activity. 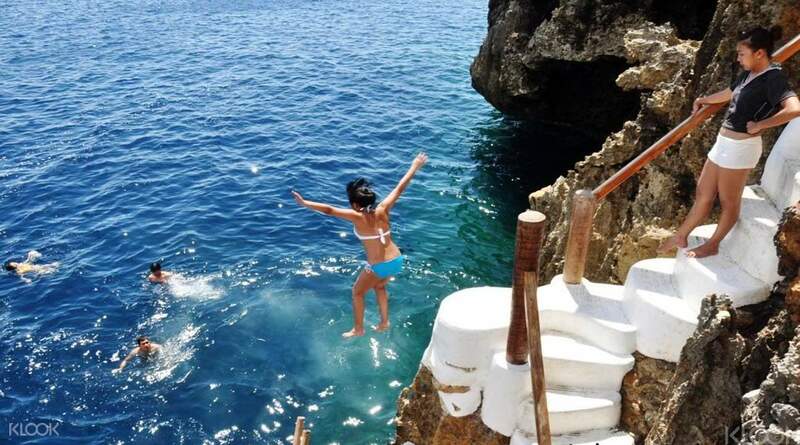 Take a leap of faith and plunge into the beautiful waters of Boracay at one of the world's top cliff diving destinations. Located on the edge of a fishing village, Ariel's Point boasts lush tropical forests, clear turquoise waters, abundant marine life and volcanic rock formations. The party starts the minute you step aboard the traditional Filipino 'banca' boat. Sip on the unlimited drinks available then decide if you want to spend your time cliff diving, kayaking, snorkelling, open water swimming or lounging - tailor your day in paradise with the wide variety of activities. Replenish yourself after a physical morning with a lunch buffet includes fresh and traditional delicacies. 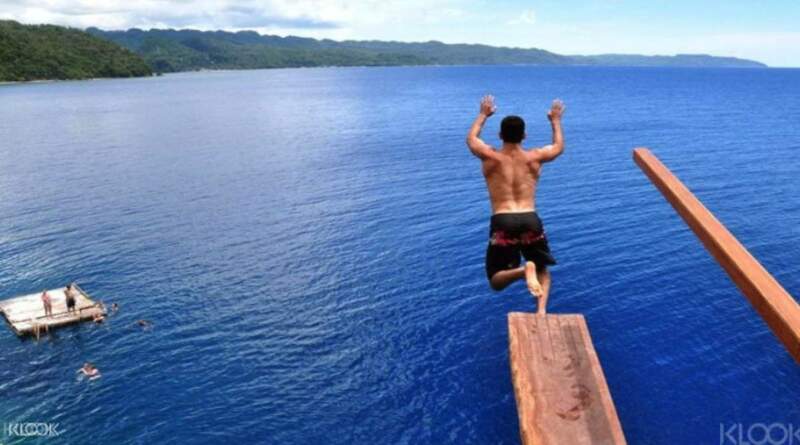 Leap into the tropical waters from 18 meters up! Amazing experience! Even if I was a solo traveler, I got to meet friends there so it was still fun. Staff were friendly and accommodating, though I suggest you add photo services to your activity for a complete experience! Will definitely be back for that 8 and 15-meter jump though. Thanks Klook! Amazing experience! Even if I was a solo traveler, I got to meet friends there so it was still fun. Staff were friendly and accommodating, though I suggest you add photo services to your activity for a complete experience! Will definitely be back for that 8 and 15-meter jump though. Thanks Klook! Great experience, very smooth. Unlimited drinks and beers (even alcohol) are definitely a plus. There’re some snacks during the stay on the Ariel’s point, very thoughtful (caramel bananas are the best!) Great services, friendly staffs (they will keep serving you beers and alcohol, be careful :P) Highly recommended!!! Great experience, very smooth. Unlimited drinks and beers (even alcohol) are definitely a plus. There’re some snacks during the stay on the Ariel’s point, very thoughtful (caramel bananas are the best!) Great services, friendly staffs (they will keep serving you beers and alcohol, be careful :P) Highly recommended!!! Great experience! The trip is organised well with free flow drinks as soon as the boat departs. The activities and location makes this a great day trip. Would do this again. Great experience! The trip is organised well with free flow drinks as soon as the boat departs. The activities and location makes this a great day trip. Would do this again. Briefing only starts at 11am, despite making us reach at 9.30am! But it's okay, near the meeting point they have a nice beach club and view of the beach. Took our boat of around 24 pax to Ariel's point (basically a private cliff all to ourselves). They have a bartender, nice seats to laze on, and from 12.30pm till 3.30pm to get to do all the water activities you want, eat and drink. I advice you avoid drinking the rum shots they feed you so early in because it takes 2 hours before you feel the effect. The guides and people there were so friendly, definitely worth it. Briefing only starts at 11am, despite making us reach at 9.30am! But it's okay, near the meeting point they have a nice beach club and view of the beach. Took our boat of around 24 pax to Ariel's point (basically a private cliff all to ourselves). They have a bartender, nice seats to laze on, and from 12.30pm till 3.30pm to get to do all the water activities you want, eat and drink. I advice you avoid drinking the rum shots they feed you so early in because it takes 2 hours before you feel the effect. The guides and people there were so friendly, definitely worth it. Absolutely enjoyed this trip! Highly recommend for the one who truly likes to challenge himself and get unforgettable experience, and also wants to enjoy partying with friends and cool people. 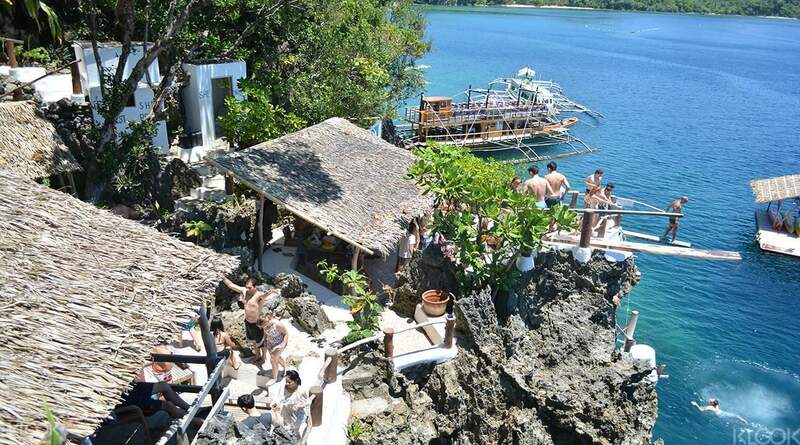 Ariel's Cliff Point is an amazing venue with a three main springboards of 5, 8 and 15 meters, accommodated with a bar, a lot of tables at different layers and a restroom for convenience. Organizers of the trip very generous and nice people, they continuously serve drinks during the whole trip and make sure you have tons of fun and enjoy a delicious food during the lunch. Absolutely enjoyed this trip! Highly recommend for the one who truly likes to challenge himself and get unforgettable experience, and also wants to enjoy partying with friends and cool people. 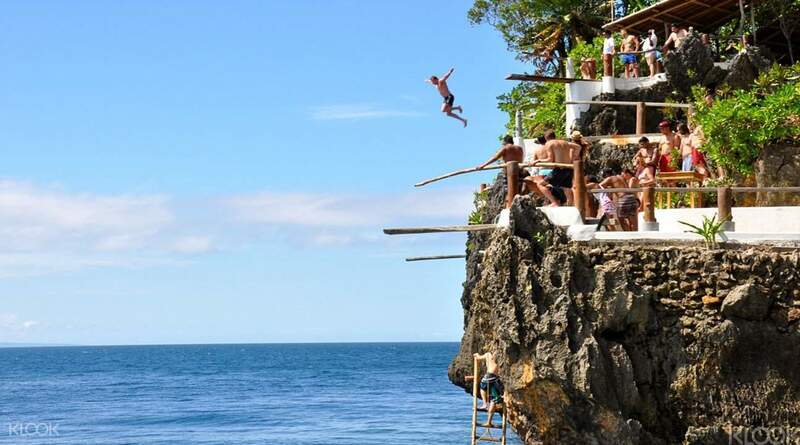 Ariel's Cliff Point is an amazing venue with a three main springboards of 5, 8 and 15 meters, accommodated with a bar, a lot of tables at different layers and a restroom for convenience. Organizers of the trip very generous and nice people, they continuously serve drinks during the whole trip and make sure you have tons of fun and enjoy a delicious food during the lunch. A fantastic day out for my entire family - from 9-yr old kid to 70-yr-old father. Other than the jumping, we also snorkel and canoed. Things are well maintained, staff were professional and friendly. Food & drinks were great too. Highly recommended! A fantastic day out for my entire family - from 9-yr old kid to 70-yr-old father. Other than the jumping, we also snorkel and canoed. Things are well maintained, staff were professional and friendly. Food & drinks were great too. Highly recommended! One of our friend had a back injury after jumping from the 15m, luckily it was a muscle injury and not a bone injury. Standing paddle and kayaking were fun, and it's good that they have these side activities for those who got tired after cliff diving. Please try to solve the flies infestation problem as it is annoying to be eating with lots of flies around. One of our friend had a back injury after jumping from the 15m, luckily it was a muscle injury and not a bone injury. Standing paddle and kayaking were fun, and it's good that they have these side activities for those who got tired after cliff diving. Please try to solve the flies infestation problem as it is annoying to be eating with lots of flies around. The toilet needs to be improved. There is not enough toilet cubicles for the large crowd. The activity itself is fun and thrilling, but please jump cautiously as many have injured themselves in the process. The toilet needs to be improved. There is not enough toilet cubicles for the large crowd. The activity itself is fun and thrilling, but please jump cautiously as many have injured themselves in the process. Awesome cliff diving experience and Kayaking/ snorkelling thrown into the package made it worth it. Highly recommended - not for the faint hearted! Awesome cliff diving experience and Kayaking/ snorkelling thrown into the package made it worth it. Highly recommended - not for the faint hearted!